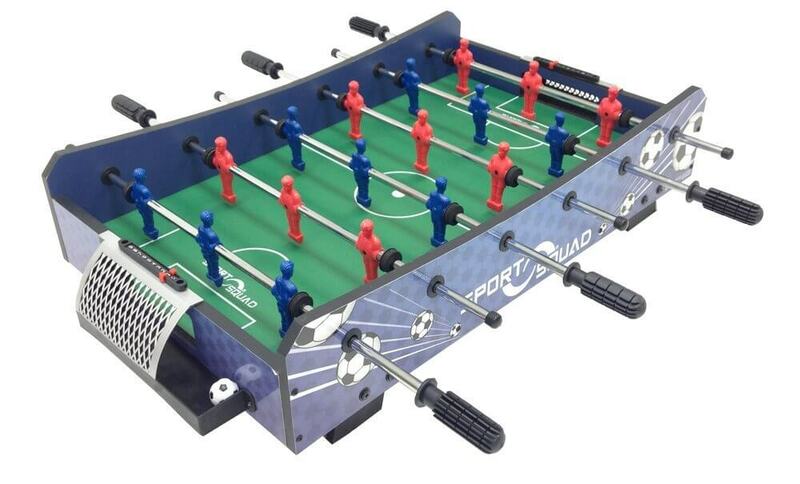 The Sport Squad FX40 tabletop Foosball Table game is our #1 pick for best tabletop foosball table. If you can’t afford a full table, or you don’t have the space, but still want to score some slick goals and have a ton of fun, the Sport Squad FX40 is a great choice. Foosball is the kind of game that is fun for just about anyone. I’ve seen 10-year-old boys playing against their 80-year-old grandma, losing, and still having a blast! This is especially true with portable tabletop options, including the Sport Squad FX40. It offers fans the option of playing at home, taking your table with you on-the-go, or experiencing fun at the home of a friend. This table is also an inexpensive way for more experienced players to practice their game. While you’re not getting any kind of professional play out of this table, it still provides a nice level of stable and reliable play. Its sturdy plastic is heavy enough to withstand some very heated and competitive play, and the chrome-plated steel rods allow for quick action and some accurate and swift shots. Again, it’s not at a professional level, but that’s not the point of this particular model. Any Good Portable Foosball Table needs to come with a variety of extra items that makes it more fun to play. This particular model includes sliding manual scorers that help make it easier to keep track of your game. While automatic score keepers are nice, they are typically not available on inexpensive portable models. The legs are also great for keeping it level and stable on the table as things heat up. This model is one of the best portable foosball tables because it offers an ergonomic design that makes it easy to use. For example, the rubber handles are designed to fit comfortably in your hand for easy control. This allows you to play for hours without getting sore. It also includes strategically placed plastic players to improve your accuracy and shooting, making it a surprisingly effective practice table. Can younger kids play on this model? When fully assembled, it’s about 15 pounds. This gives it a very lightweight nature that is easy to transport. Ha, not a chance. Unfortunately, this model does not come with counterbalanced players. This does help add to its affordability, though, as counterbalanced players add to the price of a foosball table. The decent construction, low price, and super fun competitive play offered by this portable tabletop foosball table make it one of the best foosball tables for this particular niche. Again, don’t expect serious or professional-level construction. However, you can expect to have a lot of fun playing against your friends and family in a variety of circumstances.